Published Thursday, December 29, 2016, OK personal/derivative use; link www.lovethatimage.com. Our typical Seattle endless gray wintertime weather is kind of getting to me. I need brightness and color. 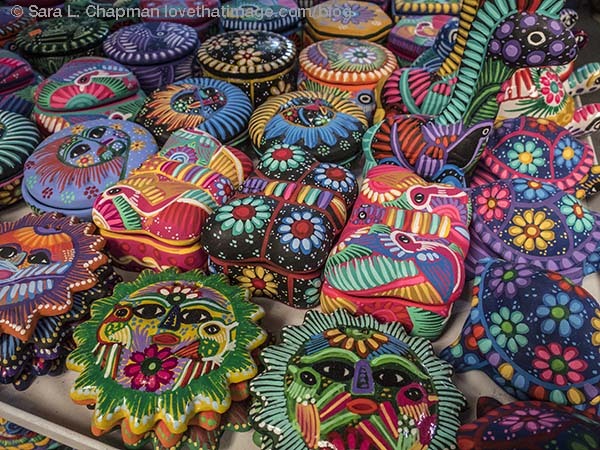 Here are some painted boxes from my trip to Mexico in March. Including this link at Our World Tuesday, Monday Mellow Yellows, Macro Monday, Ruby Tuesday 2, Orange You Glad It’s Friday, Photo Friday, and Pink Saturday. Thanks for your visit here first, and hope to see you again very soon. At first glimpse Sara they look like cushions. They are so bright & beautiful. Ah, I am a Seattle native – I so understand your state of mind. I moved to California over 20 years ago.